Unless you live in a cave and never leave, or you’re strictly nocturnal, you’ve probably noticed the annual fall explosion of the asters. We’re lucky this group seems to like trailside and roadside habitat, because most of us walk in the woods and drive places. White wood aster (formerly Aster divaricatus, now Eurybia divaricata) is the most abundant in deep shade and in the heart of the woods, and for this reason it’s an easy one to know when so little else in this habitat is flowering. White wood aster also defies horticultural gravity by thriving in a combination of conditions that make most plants quake in their roots-- including any combination of 100% shade, clay, dry soil, compacted shallow root matrixes of trees, unstable shady slopes, variable pH, and almost whatever else you can throw at it. As a plus, in the garden it adapts beautifully to good conditions, including sun and moisture (more on that later). 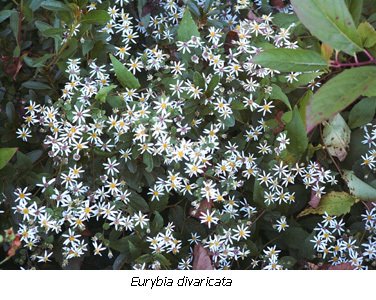 Since it’s slightly less ubiquitous, and a tad more particular, bigleaf aster (formerly Aster macrophyllus, now Eurybia macrophylla) may be less familiar to people than white wood aster. Where the white wood expresses itself almost equally well in a wide range of habitats, bigleaf seems to reach its best expression at that margin of woods and roadsides, or margin of woods and anything else- where the light is just right and the overhead competition is limited. What is that just-right light? It is some ideal balance between shade and sun, which means bigleaf can also be abundant well into the woods, if the canopy is thin enough. Taking the comparison of the two further, bigleaf shows off with a more robust inflorescence, including larger flower heads of the palest lavender, and sturdier, taller stalks. In concert with the foliage that gives the plant its name, the result is a significant, showy, coarse-textured native perennial. White wood aster sparkles with abundant radiant starry ½" flower heads, on stalks that sometimes color to burgundy or mahogany, so it’s no slouch for bloom either. White wood flowers in spilling profusion, sometimes advancing to a full flop, whereas bigleaf presents its larger flower heads more boldly on thick, burly stalks reminiscent of a few other good bold perennials--Packera aurea (golden ragwort, formerly Senecio aureus) comes to mind. Foliage of bigleaf aster can reach almost hosta-like proportions, again more so when the plant reaches its most perfect expressions in rich soil and ideal light conditions. The basal leaves are more or less cordate and coarse. Even young seedlings in the nursery can support leaves 6" long at just 3 or 4 months. White wood aster leaves are generally smaller, more acuminate in outline, and coloring to the same burgundy colors as the flower stalks late in the year. In the nursery, white wood aster seedlings often flower in the first season, at just a few months of age. Both plants spread by short rhizomes, so modest colonies form where the plants are happy. 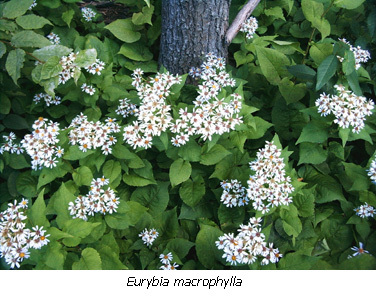 Garden conditions put pep in the step of both Eurybia divaricata and E. macrophylla. In fact, good soil can bring out the bully in white wood aster as it trounces its garden peers with a flush of spring foliage you rarely see in the poorer soils where it often lives. In smaller, more managed landscapes I recommend a buzz cut once after the first flush of leaves, or even two times before letting it settle in for the summer and approaching flowering time. This way, the inflorescences come on a more stout plant, curbing its tendency to sprawl or flop in good soil. By contrast, bigleaf aster doesn’t seem to need as much tinkering-- but it will also spread more aggressively in good garden conditions. The result is hard to beat, in either case: a starshower of late season color in the herbaceous border. And you won’t rue the day you planted either of the two; they’re not irrevocable. In the garden, these two asters (and quite a few others) are at home underplanted among shrubs, and work well under trees in natural woodlands gardens too. In short, they look great in landscapes that mimic their natural habitat. But they also work well in mixed perennial plantings as components of more traditional landscapes because they lend classical elements to any garden-- late season color and medium to coarse texture. The flowers of white wood aster might be considered fine texture even though the leaves are otherwise. Plants migrate along routes of favorable conditions—coastlines for salt marsh plants, river valleys for riparian or floodplain species, etc. In the case of our two asters in question, both white wood and bigleaf asters show classic refugial distribution along the Appalachian mountains. Plants of northern affinity often follow the Appalachian chain down south because the mountains offer cool refuge in the warm south. Presumably both species migrated south during periods of cooler climate (glacial maxima and generally colder periods), and probably enjoyed more widespread range east-to-west as well. During colder periods, further south may have been just right ecologically. As climate warms, species fitting this pattern retreat to the cool refuge of the mountains, the cove forests and higher elevations that maintain lower daytime highs and capture more moisture and shade. This southern mountain microenvironment mimics our northern conditions enough to make these species happy so far south today (including Georgia, South Carolina, and for E. divaricata, Alabama) although you won’t find them in the exposed lower elevation areas there. An occasional occurrence in an eastern county of Georgia or South Carolina is either evidence of wider longitudinal range in cooler periods, or the adventurous dispersal tendencies found in wind-borne seed. In the northern part of their ranges, both asters enjoy more widespread abundance. 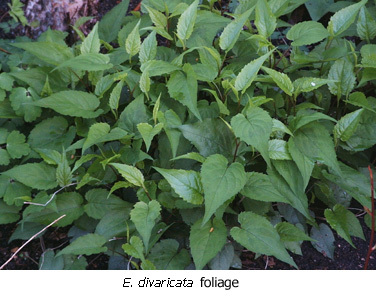 Eurybia macrophylla occurs in about 2/3 of the counties in New York; E. divaricata in a little less than half. By comparison, E. macrophylla is found in only 2 of what appear to be over 100 counties in Georgia. While many bemoan name changes in the puzzle of modern taxonomy, there’s a basis for new names in both the genealogy of the plants and the choosing of a new name. Consider the nuances as revealed by Hesiod’s explanation of who Eurybia was, and also note the wide range of languages in which the root for "star" is cognate, including Old Saxon and Old Norse, Welsh, Greek, Indo-European and Sanskrit. -"(Eurybia’s) husband was Krios, the Titan god of the constellation Aries, whose risings marked the new year in the Greek calendar. Her...third son Astraios (the starry one) was the father of...the stars and the seasonal winds..."
O.E. steorra, from P.Gmc. *sterron, *sternon (cf. O.S. sterro, O.N. stjarna, O.Fris. stera, Du. ster, O.H.G. sterro, Ger. Stern, Goth. stairno), from PIE *ster- (cf. Skt. star-, Hittite shittar, Gk. aster, astron, L. stella, Bret. sterenn, Welsh seren "star"). So next time you find yourself admiring the late season glory of the asters, think about Eurybia and her heart of flint within her. And enjoy the stars.